A2Z was called to clean up a fuel spill at the Constellation substation known as the Philadelphia Road Substation, located on Haven Street in Baltimore, Maryland. More than 10,000 gallons of diesel fuel had leaked from an AST (Above Ground Storage Tank) at the Philadelphia Road Substation. 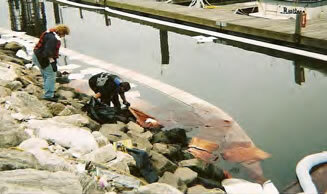 The fuel had followed the path of the storm drains and most of it was in the Baltimore Harbor. Under the direction of the United States Coast Guard and the Maryland Department of the Environment, an A2Z crew of ten took to the task of recovering the fuel. Recovering the fuel from the water required the use of boom to corral the fuel, and a skimmer to separate the fuel from the water. The skimmer is a floating device that is operated with air to turn the drums under the cover, separating the fuel from the surface water. The fuel is then vacuumed off, via a vacuum truck. to clean oil off the water‟s surface. Ten thousand gallons of fuel were recovered and sent to a local recycler for recycling. 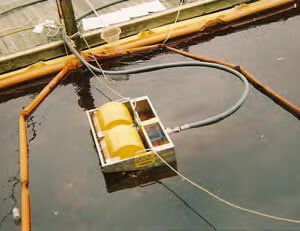 Sweep, a floating absorbent, was used to help get minute amounts of fuel off the surface of the water. The call was taken during the mid-morning hours and by midnight the bulk of the fuel was reclaimed, including all of the fuel that wound up in the water. 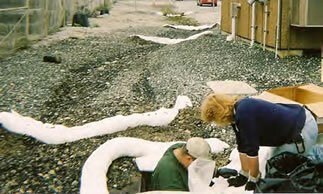 The next day, the storm drains were cleaned and additional fuel was recovered. The storm drains had to be opened and an A2Z team entered to remove all signs of the presence of fuel. 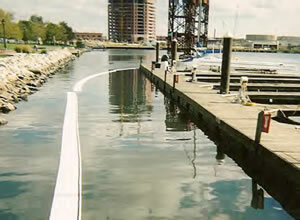 Absorbent boom was applied and changed at regular intervals. The spill originated in a sub station where the fuel contaminated the gravel and soil it contacted. Several 20 yard containers of gravel and soil had to be disposed of in a landfill that is regulated to take low content oily soil and debris. Fuel can be seen floating in this photo. The storm drains follow the path of the fuel. Notice the dark area in the center of the photo.